Have you heard the buzz? Electronic flash cards are a great way to give math skills a jolt. Reinforces addition, subtraction, multiplication and division. Offers 60-second timed mode, untimed mode, and 3 levels of difficulty. Features volume control. Requires 3 AAA batteries, not included. Ages 7+. Build number fact fluency in just a minute. Familiar fact family triangle is now electronic. Practice operations /(add//subtract or multiply//divide/) and early algebraic skills /(equations and commutative property/). Offers 60-second timed mode; low-pressure, untimed mode; and 3 levels of difficulty. Color-coded screen frames reinforce parts of the equation. Gives positive, corrective feedback /(visual and auditory/). 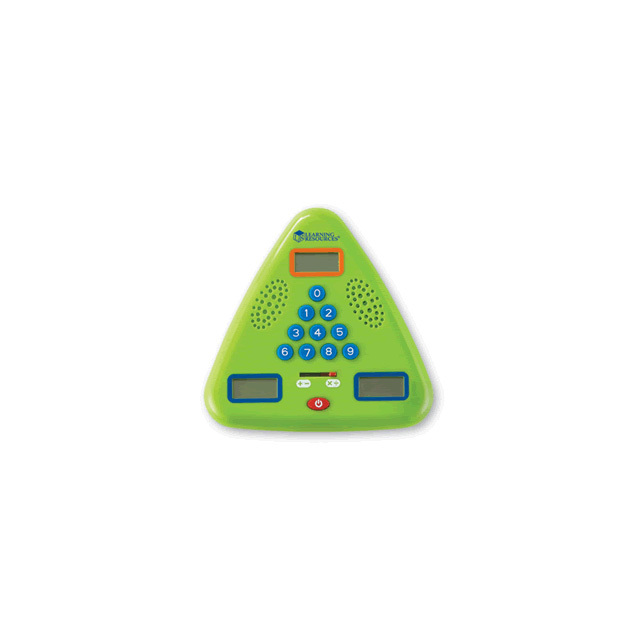 Durable unit with volume control measures 5 1//2"H. Requires 3 AAA batteries, not included. For individual practice or two students taking turns.